were kidnapped and sent to work there as labourers and servants. The first permanent English settlement in North America was made in 1607 at Jamestown (named after King James I) in the state of Virginia. It was financed by the London Virginia Company who sent over men in the hope of finding gold there but who instead began farming tobacco to earn their money. In September 1620, a group of people nicknamed the Pilgrim Fathers sailed from Plymouth, England to establish another new settlement in North America on a ship called The Mayflower. After two months at sea, they landed on Cape Cod on 11th November 1620. 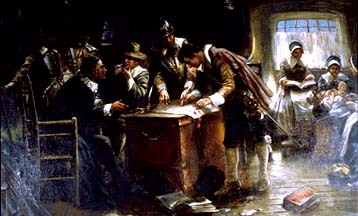 The 41 male passengers on board all signed the ‘Mayflower Compact’ to agree to make an orderly and civil society – this would later help to form the United States constitution. The colonists lived on the ship for a few more months, rowing to shore to build houses in the day and returning to the ship at night. During their first winter, they struggled in the cold, wet weather and half of them died. By March 1621, there were enough houses for everyone to live in on the land. With the help of the local Native American ‘Indians’, the Pilgrims learned how to: hunt, fish and plant crops like maize and tobacco. Tradition has it that in 1621 they then held a thanksgiving feast to celebrate their first harvest – this still takes place every year in the USA to give thanks for the work they did founding America. By 1630, nearly 1,000 people had settled in this new colony which they named Plymouth, in the state of Massachusetts. Within a few decades, the English had settlements all along the east coast of North America and on islands in the Caribbean. The state of Carolina was named after King Charles II in 1663 and Jamaica began supplying England with: sugar, coffee, ginger and pepper.